CONGRATS (USA) (Bay 2000-Stud U.S.A. 2007, Aust. 2011). 7 wins-1 at 2, Santa Anita San Pasqual H., Gr.2. Sire of 513 rnrs, 324 wnrs, 22 SW, inc. Turbulent Descent (Hollywood Starlet S., Gr.1), Emma's Encore, Wickedly Perfect, Forever Darling, Jacaranda, Polar River, Haveyougoneaway, Check My Cheeks, etc. His oldest Aust.-bred progeny are 3YOs and inc SP Commiserate and of Forty Four Red, Royal Applause, Sir Charleston, Wide Acclaim, Contralto, One From Many, And Jubilations, Dark Ensign, etc. Placido (g. by Flying Spur). 2 wins at 1100m, TRC Hi-Lite Plaster H.
Royal Applause (f. by Congrats). Winner. See below. Cahuenga (f. by Stravinsky). 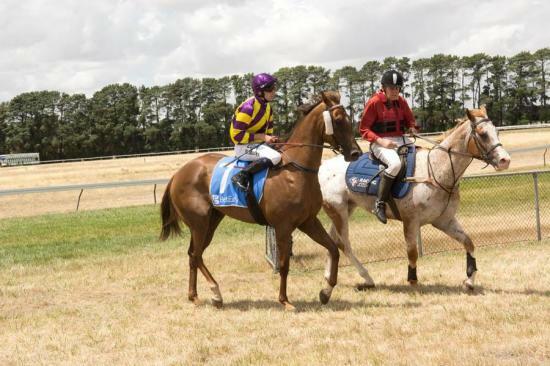 2 wins at 1350m in Aust. Confederate Rose (f. by Shamardal). Winner at 1700m in Aust. ANNIHILATE (Salt Lake). 3 wins from 6f to 8½f, Woodbine Peteski H., L, 2d Woodbine Achievement H., Can-3, 3d Woodbine Colonel RS McLaughlin H., Can-3, Meadowlands Paterson H., L. Sire. Slender Option. 3 wins from 1300m to 1600m in Aust. Tisani Lad. Winner at 1200m in Aust. Heart Summer. 10 wins to 1500m to 2015 in Philippines. Dixie Storm. 4 wins-2 at 2-to 1500m to 2015 in Philippines. Sweet Daddy's Girl. 4 wins at 1300m, 1400m to 2015 in Philippines. Tamarisk. Winner at 6f in U.S.A. Producer. Dubai Creek. Winner at 8¼f in U.S.A.
LUCKY DI (Diesis). 2 wins at 1m, 1¼m, Kempton Magnolia S., L, 2d Sandown Brigadier Gerard S., Gr.3. HERITAGE HALL (Fairy King). 4 wins-1 at 2-from 5½f to 8½f, Bay Meadows Half Moon Bay S., L, Curragh Pricewaterhouse Coopers 2YO S., 4th Hollywood Cinema H., Gr.3, Bay Meadows Derby, Gr.3, Bay Meadows Ascot H., Gr.3. POLLOCK'S LUCK (Polish Navy). 6 wins-1 at 2, US$375,858, Bay Meadows Ascot H., Gr.3, Santa Anita Rising Market S., L, Fairplex Pomona H., L, 2d Hollywood Affirmed H., Gr.3, Manila H., L, 3d Hollywood Flying Continental H., L, 4th Hollywood Derby, Gr.1. Sire. BID US (Bold Bidder). 6 wins, US$272,275, Hollywood Bel Air H., L, 2d Bay Meadows Saratoga H., L, 3d Hollywood Ancient Title H., L, Golden Gate Albany H., L. Sire. COYA (Deputy Minister). 4 wins at 7f, 9f, Charles Town HBPA City of Ranson H., L, 4th Laurel Maryland Racing Media H., L. Producer. Canzoni (Unbridled's Song). 3 wins-1 at 2-at 8½f to 2015, Belmont Allowance, 2d Ocala OBS Championship S. (c&g), L.
Capac (Deputy Minister). 5 wins-1 at 2-from 6½f to 9f, 2d Laurel Harrison E Johnson Memorial H., L.
P T's Jewel (Prince T.). 2 wins-1 at 2-at 8¼f, 2d Fair Grounds Sarah Lane's Oates S., L.
National Center (Tsunami Slew). 6 wins-1 at 2, Albuquerque Con Jackson H., 2d Turf Paradise Hasta la Vista H., L.
Lone Sky (Septieme Ciel). Winner at 2, 3d Arlington Park Johnny Morris H., L.
Greenwood Meadow (Greenwood Lake). 4 wins from 6f to 1m, 2d Northlands Park Count Lathum S., L, 3d Northlands Park Edmonton Juvenile S., L, 4th Northlands Park Ky Alta H., L.
Fashion Award (Hold for Gold). 7 wins-1 at 2-from 7f to 9f, US$203,484, 2d Laurel Japan Racing Association S., L.
Free Tero (Freelancer). 3 wins-1 at 2-at 1000m, 1100m in Argentina, 2d Palermo Clasico Hipodromo Argentino, Gr.3, 3d La Plata Especial Iniciacion. Khaki. 4 wins at 1600m in Argentina, La Plata Especial Mexico, 3d Palermo Premio Listada. Race Record: 4 Starts 1-1-1 A$13,075. Winner at 1300m in 2015-16, 2d MVRC McMahon's Dairy H.